Product categories of KS Standard Glass Beads, we are specialized manufacturers from China, KS Standard Glass Beads, KS Standard Micro Glass Beads suppliers/factory, wholesale high-quality products of KS Standard Reflective Glass Bead R & D and manufacturing, we have the perfect after-sales service and technical support. Look forward to your cooperation! KS Standard Glass Beads,Appearance: colorless transparent sphere, round and smooth, no obvious bubbles or impurities.1,micro glass beads for road marking paint as reflective material; 2, glass beads for road marking paint; 3 glass beads for traffic. 4; round rate of ≥ 80%; Density :2.4-2 .6g/cm3; refractive index: Nd ≥ 1.50 . 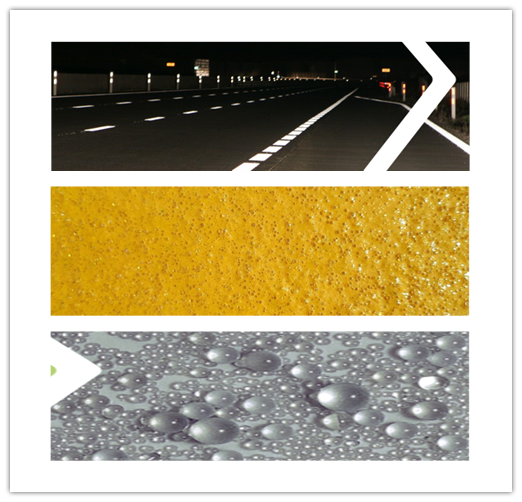 For the visibility of road markings reflective glass beads are a major component. Together with the marking material the reflective glass beads constitute the retroreflecting system. The micro glass beads embedded in the marking material reflect the headlight of the car, hence the marking lights up at night. This [lighting up" – retroreflection – makes the road marking better visible for the driver and is thus an important and crucial factor for road safety. blyglassbeads one of China reflective glass beads factory can offer a wide range of products and reflective glass beads with refractive indices ranging from ≥ 1.5 to 1.9. In addition it is guaranteed that impurities (e.g. iron) are minimized and/or heavy metal contents. The production of all reflective glass beads confirms to national and international standards (BS6088, EN 1423, EN 1424, AASHTO, etc.). Individual customer requests are possible with any type of reflective glass beads.